There is an historical element throughout philosophy. As Edel notes, this is always in the context of problems, so emphasis will fall on the major objective of reflective analysis of ideas. 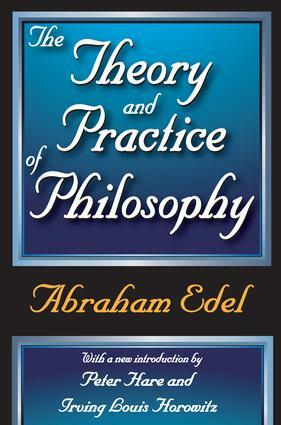 The major objective of Edel's analysis in The Theory and Practice of Philosophy is the fundamental interrelatedness of problems of method, metaphysics, and value. Each part is an integral whole, complete in itself.That philosophy has this central role in human practice indicates that it should be neither discarded nor deified. This is the explicit premise of the book. Students are likely to be faced increasingly with a demand for clarification on the fundamental issues of life and value. The expectation that philosophy will provide ready-made answers to these kinds of questions is as naive as the demand for any panacea, but this task cannot be turned over to any other department of human knowledge or any other branch of social activity.By placing emphasis on the importance of theory in matters of practice, the need for clear and systematic understanding of the world and man within it, and on the constant role of reflection in the management of human affairs, Edel seeks to shed light on the larger questions of philosophy by examining them in a systematic way. The result is a great text and tool for students and teachers that deals directly with the fundamental issues of our civilization. PART III: WHAT IS A MAN?